Hallie Durand, aka Holly McGhee of Pippin Properties, Inc., came into writing long after she opened the doors of Pippin in 1998. She believes that the world is full of magic, and becoming an author almost six years ago gave a new and magical dimension to her literary career. 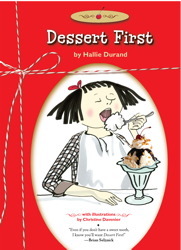 For Hallie, creative writing is an essential companion in the happiest of times, and in the loneliest of times, and Hallie was thrilled when Dessert Schneider, the star of her Dessert trilogy, marched into her life and made her pay attention. Hallie thought she knew a lot about writing until she tried it herself--the experience of writing her own books taught her the immeasurable joy of making a difference through words and it also helped her understand the authors she represents as an agent more fully. 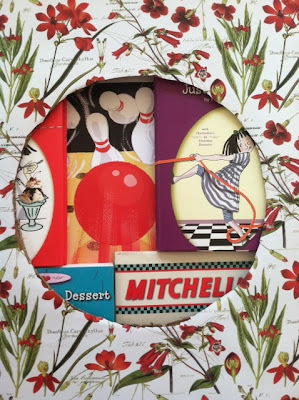 In addition to her three books about Dessert, Hallie published a picture book, Mitchell's License, illustrated by award-winning artist Tony Fucile, in 2011 and the pair have another Mitchell book coming this fall: Mitchell Goes Bowling, both from Candlewick Press. You'll see a big bowling ball in the center of Hallie's dot. She and Tony both love bowling alleys, the sound and the smell and the chance to knock stuff down, and they've had tons of fun working on this new book! 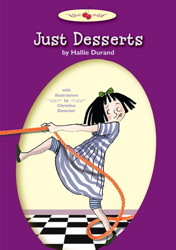 Hallie's third picture book, Catch That Cookie, will be published by Dial; the illustrator will be David Small. Hallie lives with her husband and three kids fifteen miles west of the Lincoln Tunnel. Second to her family and friends, Hallie's two great loves are the children's book industry, every bit of it, and the place she feels most at home: New York City. 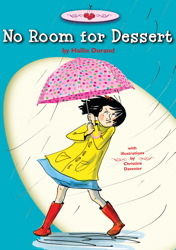 "As an agent, the first book I worked on with Peter H. Reynolds was The Dot. From the first drawing I ever saw of Peter's, a little tea cup on his web site, I knew I wanted to accompany him on this journey. He never fails to make me think, and he never fails to make me wonder. Thanks to T J Shay's extraordinary vision, I am happy to add my small dot to the universe. I am happy to 'make my mark. *'"
*thank you Peter H. Reynolds for coining the term: MAKE YOUR MARK! Thanks, Hallie! : ) Love your dot!